Special taxes on the rich are counterproductive, according to Dr. Daniel Mitchell, senior tax analyst at Cato Institute in Washington DC. He argued for this at a well-attended seminar organised by the Icelandic Taxpayers’ Association and RNH in Reykjavik 4 November 2013. Mitchell pointed out that ordinary people on fixed salaries and with fixed hours could do little about it if their income tax was raised. But rich people usually derived their income from other sources, such as investment and management of private companies. If the tax on their income was raised, they had many means to avoid paying more tax. A horde of lawyers and accountants were at their disposal. Thus, many kinds of economic distortions were created by a progressive income tax or other kinds of special taxes on the rich. One example given by Mitchell was that some rich people in the United States bought municipal bonds because income from them was tax-free. But this was not necessary the most productive use of their money for society in the long run. Mitchell reminded his audience that Ronald Reagan had cut taxes on the rich, with the consequence that their number had increased considerably and also the tax revenue from them. He discussed the Laffer Curve which shows that tax revenue is zero at a 0% tax rate and again zero at a 100% tax rate. Observing that there was no controversy about this, Mitchell said that the issue was where on the curve the revenue-maximising point was. 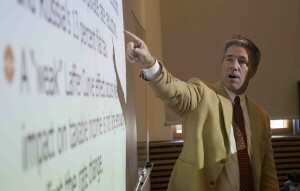 Paul Krugman and other dirigiste economists believed that the point was about 70% for taxes on the rich, but their analysis had been contested by economist Alan Reynold. Mitchell said that he himself believed that the point was closer to 20%. However, the objective ought not to be to maximise tax revenue, but rather to maximise economic growth in the long run, and to do so the tax rate had to somewhere around or under 20%. A lively discussion followed Mitchell’s lecture, where the special temporary wealth tax imposed by the left-wing government of Johanna Sigurdardottir and Steingrimur J. Sigfusson was mentioned, and also the special charge on the fisheries aimed at seizing the profits of fishing firms.